I.S. 318 are H.S. Champs! (L-R) Justus Williams, James Black, Isaac Barayev and Matthew Kluska. The hardware just keep piling up for I.S. 318. As the screening for the movie “Brooklyn Castle” continues, the middle school has perhaps added another saga to its spectacular run of success. 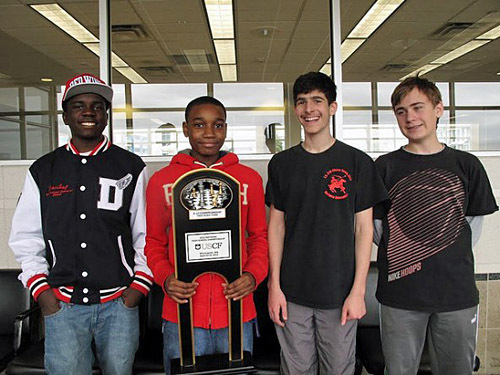 Led by Justus Williams, the school bested New York’s Hunter College to win the K-12 School Championship. Williams (2307) was the leading scorer with 5.5/7 with Issac Barayev (2141) and Matthew Kluska (1844) with 5/7 and , teamed with James Black Jr. (2312) with 4.5/7. The team won the Jr. High championship a couple of years back. 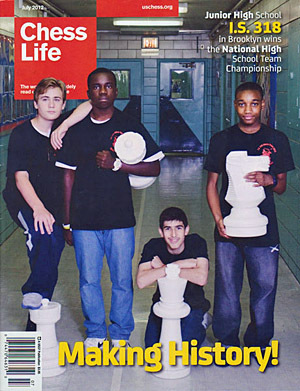 It is presumably the first time a middle school has won the high school championship. A video segment on the National Championship… last year’s champions, Eric Rosen and Rochelle Ballantyne are featured. I was giving an exam in my early class and brought the New York Times with me. What did I see? IS 318 on the front page! I read it with a sense of pride. I’m sure the students wondered what I was smiling about. Another incredible achievement! Incredible achievements seem to happen weekly with these wunderkinds. I guess they came in 2nd last year so they are almost two-time National High School champs while only in Middle school! With Rochelle Ballantyne being on last year’s winning team, we have 2 straight years of African-American winners. By the way, Justus received the “Life Master” title on the 8th of this month. Mikhail, are you confusing Josh with Justus on the Life Master Title? Hi Mr. Colas! Josh earned the “Original Life Master” title last month which is earned with 300 rated games as a National Master. Justus just won the “Life Master” title which is a newer norms-based title that doesn’t have the original requirements– I’m not sure what they are. Congrats to both! By the way, if I’m not mistaken, Rochelle Ballantine won a full ride to the University of Texas as the girls’ individual top performer last year. It’s certainly not going to be the last, though, as so-called “kiddie” teams are becoming stronger and stronger. In fact, keep an early eye out for Kennedy MS (Cupertino, CA). They’ve got four 6th-graders this year with an average rating of 2136. Yes… I saw that school in Cupertino as well as some of of the high schools with more than one 2400-rated players. Of course, we know age has little to do with strength and these open tournaments are crawling with these little piranhas playing up a section or two. IS-318 graces cover of Chess Life!